2013. xxxii + 243 pp. Includes Index. and Engineering, Vol. 29) Springer, New York. 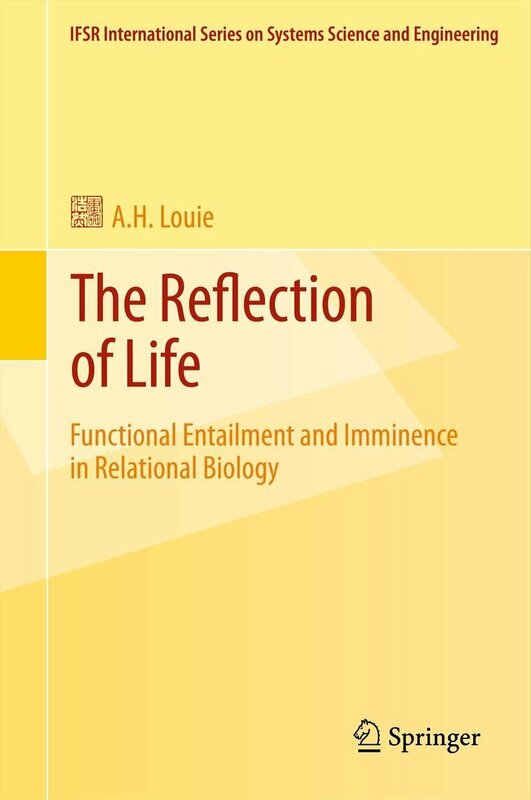 A. H. Louie’s The Reflection of Life: Functional Entailment and Imminence in Relational Biology [RL] is a continuation of the exploratory journey in relational biology begun with his 2009 monograph More Than Life Itself: A Synthetic Continuation in Relation Biology [ML]. The theme of ML is ‘What is life?’; the theme of this sequel RL is “How do two lifeforms interact?”. Biology is a subject concerned with organization of relations. Relational biology is the approach that hails ‘function dictates structure’, rather than ‘structure implies function’. It is mathematics decoded into biological realizations. The Reflection of Life demonstrates some of the powers of the approach that is relational biology, and illustrates how pertinent problems in biology can be better addressed this way. The cast and crew of mathematical and biological characters in ML include partially ordered sets, lattices, simulations, models, Aristotle’s four causes, graphs, categories, simple and complex systems, anticipatory systems, and metabolism-repair [(M,R)-] systems. Here in RL, the cast and crew are expanded to employ set-valued mappings, adjacency matrices, random graphs, and interacting entailment networks. The theory of set-valued mappings culminates in the imminence mapping, which equips the further investigation of functional entailment in complex relational networks. Imminence in (M,R)-networks that model living systems addresses the topics of biogenesis and natural selection. Interacting (M,R)-networks with mutually entailing processes serve as models in the study of symbiosis and pathophysiology. The formalism also provides a natural framework for a relational theory of virology and oncology. This book will serve researchers and graduate students in mathematics and biology.